CHARLESTON, W.Va. (October 17, 2016) – Beyond The Backyard has been selected for the 2016 Best of Charleston Award in the Non-Profit Organization category by the Charleston Award Program. Daniel Smith, far right, is pictured with his son, Garrett, at left after getting his first gobbler. 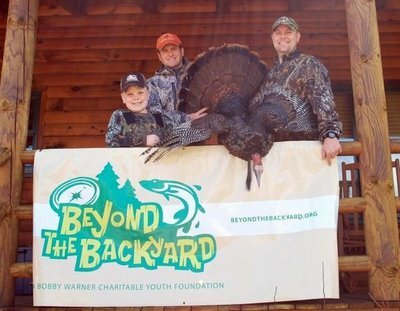 Smith won a hunting trip called Beyond the Backyard. CHARLESTON, W.Va. -- Anglers who fish one of West Virginia's best-known catch-and-release bass-fishing spots might one day get to keep some of the bass they catch. The WV DNR has stocked many locations this week with trout. For a complete list of locations, visit the WV DNR website. Not on our mailing list? Have your parents sign you up today! It's totally free.